Growing up, one of the things that I liked about road trips was seeing license plates from different places. Driving from upstate NY to North Carolina and other parts of the south along the Atlantic Coast allowed us to see many items. 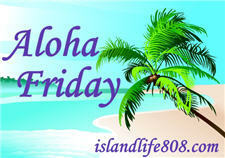 Of course, I still remember the gorgeous license plates from our trip to Hawaii in 1988. I think I took license plates for granted until recently. I knew they changed in New York from time to time, but never thought much more of it. Enter being an adult and realizing that the change in plates being an increase in registration fees and everything else that the state slaps on. Hello instant revenue in one easy step. For those of us in New York, we are experiencing this right now. Our very generous governor (on his way out – might I add) decided to alter the plates. Nobody knows why since they were not an improved look, we all speculate it was a nice money maker for New York which is in a lot of trouble. My feeling is that this should have been canned and redone to make it better. This was rushed and uncalled for at this point in time. Luckily, mine will not be switched out for quite some time. What state are you from and do you like you license plates? Also curious if yours have changed a lot during your lifetime or stayed mostly the same. Maryland and no I do not like any of the plates here. Oh dear, those new plates ARE ugly. I like the blue and white they have now. I do like Colorado’s plates, and there is quite the variety of them. The standard has white mountains with a green border at the top. I’ve also seen the border in red, light blue, orange and various other colors, denoting different organizations – college alumni, military, dog rescue, etc. There’s also an inverse where the mountains are green and the border is white. You can also get a designer plate that’s a pretty green with the mountains at the top. 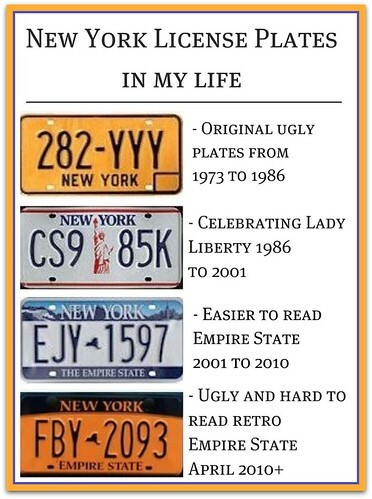 I hate the new NY plates and I refuse to get them on my car until I have to! Besides, orange clashes with every other color, can you imagine if your car was maroon? We need a women to design the plate!